I managed to fit in two different talks it the same week following on from the AWS User Group event. Thankfully this isn't the norm - I'd never get any exercise in! However, on this occasion, it was well worth it. Following on from the Cloud Tech event, it was interesting to see a talk on 'Business Model Disruption and the Human Cost' hosted at DIT Aungier Street, Dublin. If the previous talk covered the terms 'cloud' and 'infrastructure' and 'infinite', this event ticked off the boxes when it came to 'digital transformation', 'agile' in the bingo word games! If you follow the headlines, the world in the 21st century appears to be sinking into chaos, hatred, and irrationality. 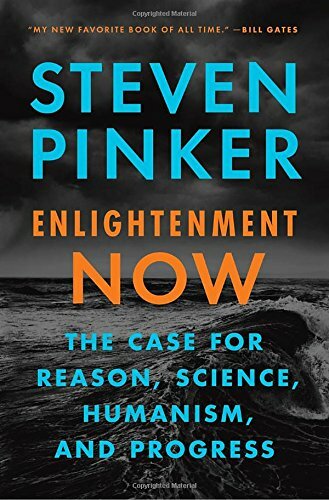 Yet Steven Pinker shows that this is an illusion - a symptom of historical amnesia and statistical fallacies. If you follow the trendlines rather than the headlines, you discover that our lives have become longer, healthier, safer, happier, more peaceful, more stimulating and more prosperous - not just in the West, but worldwide. Such progress is no accident: it's the gift of a coherent and inspiring value system that many of us embrace without even realizing it. I was lucky enough to have been involved in a teaching event with a bunch of incredible Transition Year students recently also (expect to see that written up soon also) and based on their usage of 'digital' and 'technology', the future is bright! Anyway, that's enough of my rambles. Here's my notes from the event as always. As always, love to chat, share, expand ideas: there's a way to reach out on the About Page of the site, or else reply to the tweet linked to this post and I'll make sure to reply (let me know to follow you, and I'll reply privately). 10-15% of strategy actually gets delivered. Observation: lack of understanding of programme management - packaged into change management. Agile is popular. Sometimes used as an excuse not to plan correctly! Need a team of people to transform an org. Example of a terrible project: E-voting systems are an - terrible as basic questions (audit trail) not accounted for at start. Digital Fog (Organisations know must react but how to, and where?) and Risk (biggest risk is ignoring Digital as it tears up the playbook). Strategic and Tactical focus needed. 70% failure rate for most projects. Google works at a 90% failure rate(!!!) Fail fast and fail cheap. Average life of a company is decreasing. Less than 20 years on S&P500. Peaked at 50+ years. 90% of all companies gone from FTSE now. Business model may not be fit for purpose, needs to adapt to new market condition and technological change. Mind-set, skill set, tool set = success. Transformation is about change. (Most change unsuccessful - 70%). There is a current, transition and future state for Change. Most organisations fail on implementation. Only thinking: When will be finished, what's the return on investment, and how will it support the business? As an example: in schools when introducing IT teaching, they got technical part right (moving from current to future state) but forgot the people. In reality, both org and people have individual states of 'current, transition and future'. There needs to be only one strategy - can’t be a difference between business and digital strategy. Global Mega trends: digital, globalisation, climate change, demographic change. Over 50% of population over age of 50. India and China to have 1/3 of worlds wealth. China: dark factories. No humans in the whole factories. No lights, no people. Call centres: 100 million employed currently. Prediction is 90% gone in 10-15 years. 3D printing: Future workforce will have been making their own toys since age of 6 or 7. Loneliness and social networks: we have so many friends but we feel so alone. Lots of research around impacts of social networks starting to appear. Computer embedded in a wall in India, open to all. Taught themselves English, how to use the whole computer. A research project was setup where teachers would teach from London using the internet. Researchers checked after a year and found they were already fluent from self-teaching online so project had to be abandoned! IoT and AI are coming: references to all the various AI tools that will take our job. Referred to Google’s AlphaGo system that beat top players at Go: 1000’s times more complex than chess, the AI systems can take our jobs. [Note: didn’t mention that the top Go players say it’s one of the best things to ever happen – it’s improved their own game and strategic ideas: i.e. the tool can be used to improve/optimise/support human skills]. Examples of AI in use: IBM Watson responding to student questions for over six months before anyone noticed. Pharma think digital could help could R&D with cost savings (currently $4-$12 billion to develop a new drug, 12 year development time). People or customers are far more empowered now. Online opinions are now dictating opinions. Companies need to own the relationship. This was designed for steam and previous revolutions, top-down precess. People at Coal face are far more empowered now. How to implement Digital Transition in an org? People are busy. Budget is irrelevant for Digital Transition to be a success. Needs support of bottom-up approach also. However, can’t depend on volunteerism, needs financial incentives also. Change - innovation - continuous improvement (this is a cycle). Really it comes back to people. Leadership needed: Easy option is hire young digital-savvy. Consultants on digital needed however also needs Coaching and Training leadership. Observation: Digital teams usually own, and end up growing organically. Lecture hall in 1800’s is same as now except a projector. Academia has 700 years of history and routine, hard to change! Workplace has evolved a bit, more collaborative. Education sector trying to replicate some of it. Note on classroom teaching versus remote teaching: Different age groups preference over face to face learning or video (older preferred to make the trip to classroom). Need to come from where students want! Q: Should there be a module on risk or change management? A: [only part of answer] All projects are really risk management. Q: Who were best Project Managers you've seen? A: Most successful project managers had no qualifications. But they had great strategic and tactical skills. At entry level, have to have some kind of some form/cert to get in the door. Note: Strategy only as good as execution. Bottom line is who is going to deliver it. More mature organisations will very proactively look ahead. Q: One of the best giving views of all projects? A: Honeywell - visibility of 40,000 projects around the world from one location. Dashboards views. Q: What do to about companies that are pushing for digital-only, or digital-first? A: What about keeping onnichannel? Digital-first is the "Boil the ocean" strategy. Trying to put it all online doesn’t work. It's like a Piano: press all keys is a racket, individual keys makes music. Need to pick and choose the parts of digital that work for you. Q: Digital, where will it impact? A: Every business will be impacted, not a case of if but when. Q: What about the activity coming from the bottom up? A: Massive activities at bottom up, but structures aren’t there to help them. Ivory tower (senior leadership) aren’t aware. Real leadership is an input, not an output. Individuals are driving tremendous changes but businesses are putting boulders in place. Q: Is project management fit for the future? A: Project Management like raising a child. Need to adjust and adapt as they grow up. People look at all the things going wrong. Observation: Project management only really started with Y2K so a relatively young profession. Has you seen the documentary, Icarus, on Netflix? In the movie, it starts off with on the basis of a high-end amateur who’s been trying out doping to understand whether amateurs are actually doping. For the first half of the movie, we’re given an insight into the apparently-trivial process to acquire performance enhancing drugs and its usage. During this sequence, the participants are introduced to a Doping Scientist in Russia, and the movie suddenly morphs into the major Russian doping scandal that flared up prior to the Brazilian Olympics along with helping the same Russian scientist escape Russia to survive a possible assassination. The movie starts off on one topic, finishes on another with an overlapping layer. This talk on 'Digital Disruption and the Human Cost' was similar to 'Icarus'. 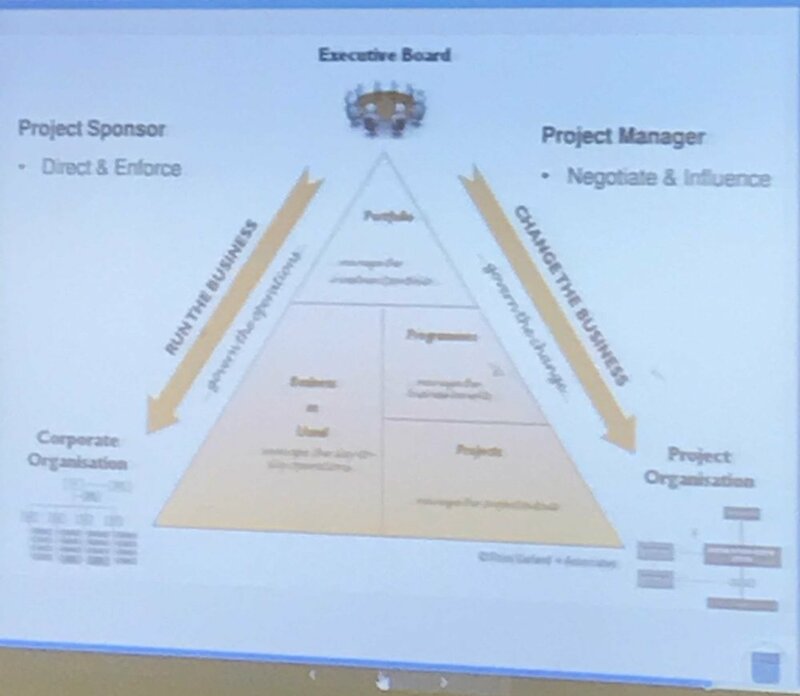 The true objective of the day was to promote DIT Aungier Street's courses in Project Management and Leadership and Innovation, however so will the talk started on the topic of "disruption trends", it ended up on the topic of "Project Management". A story of two halves! On the latter topic, I personally found it very interesting. John McGrath, the speaker has fantastic credentials in the topic of Transformation and Project Management. On these topic, the talk really delivered with a lot of interesting and intriguing ideas throughout. The reminder that the discipline of Project Management in IT has only really existed since the Y2K challenge hit the technology industry puts some context on Project Management and theories and practice. Additionally, anything that describes a project “like raising a child” is off to a great start and a fantastic analogy of the challenges in Project Management, in particular large projects! Throughout the speaker, John, gave great honest, frank insights into project management as a whole: openly reminding everyone of the relative newness of the discipline as well as also highlighting the (in my eyes) low success rate of projects. The one interesting piece that came from this and I relate to insights from my own teaching/tutoring practices, was the lack of commentary on learning from those failures. There’s a lot to be said for failing fast, but also learning fast. I’m still surprised that there rarely seems to be a feedback loop to wider audiences from projects…..
Another way of thinking about Where We Are Going, is by looking backwards and as analyst Benedict Evans likes to remind frequently when you look at everyone’s job in the picture. Below, they were absorbed by a single person on a spreadsheet, but yet we’ve still continued to create more and more jobs and fill those office floors (and countless others) with various newly created roles. In short, telling us that robotics and automation and artificial intelligence will remove some jobs is absolutely true, however we should be taking opportunities to motivate people to look at the new opportunities being created by these tools. If you follow the headlines, the world in the 21st century appears to be sinking into chaos, hatred, and irrationality. Yet…….this is an illusion - a symptom of historical amnesia and statistical fallacies. If you follow the trend lines rather than the headlines, you discover that our lives have become longer, healthier, safer, happier, more peaceful, more stimulating and more prosperous - not just in the West, but worldwide. Such progress is no accident: it's the gift of a coherent and inspiring value system that many of us embrace without even realizing it. Most recently, my week with the Code Like A Girl in Skibbereen showed me that the youth of today are completely cloud-native, intuitively understanding that everything is online and the benefits of online. If they’re given the correct support and guidance, as well as awareness of the possible courses available (see above), their capabilities will more than prepare them for any future adjustments that may occur.